If you've always wanted to create your own novelty beach towels then there's no better place. Simply choose a size, upload your photos and designs, add any funny text or slogans, and you'll have your own custom printed towel with you in no time. Bags Of Love are the originators for customisation work on towels art this scale. We have a medium towel that is great for bigger kids and two adult sizes in regular and maxi versions. With no minimum, you can order a single beach towel or an entire set. We can even make huge beach towels up to 5 metres if you so desire - just call to enquire about our large or extra large beach towels and other bespoke variants. Very happy with quality of print and product. Some concerns from you re print quality. I am more than happy with finished product. Reassuring with your concerns and communications. Excellent delivery time. Large towel arrived within a few days. It looked fantastic, my daughter will love it. I wanted to give it to her before Christmas. A big hit. If you want your beach towel printed on both sides with super thick extra luxury feel, we can print a second layer and have it sewn together so you have images front and back for added luxury. This is a little extra cost but double the value. Double thick and double printed is available on any size of our towels. To begin press start design, and from there you are able to upload graphics and images, change colours, and add text. Pop your personalised beach towel in your bag each time you take a trip to the coast. They are great fun and serve well as novelty beach towels, and handmade too. Perfect as gym, travel, or camping towel too. Our towels are quick drying and easy to pack so ideal for travelling, hiking, or at the gym. Water and oils are quickly absorbed thanks to the microfibres, and because the towel is quick drying it is less prone to stale than natural fibres. The towel is light for easy carry and is machine washable. Start designing your custom microfibre beach towel now with no minimum orders. 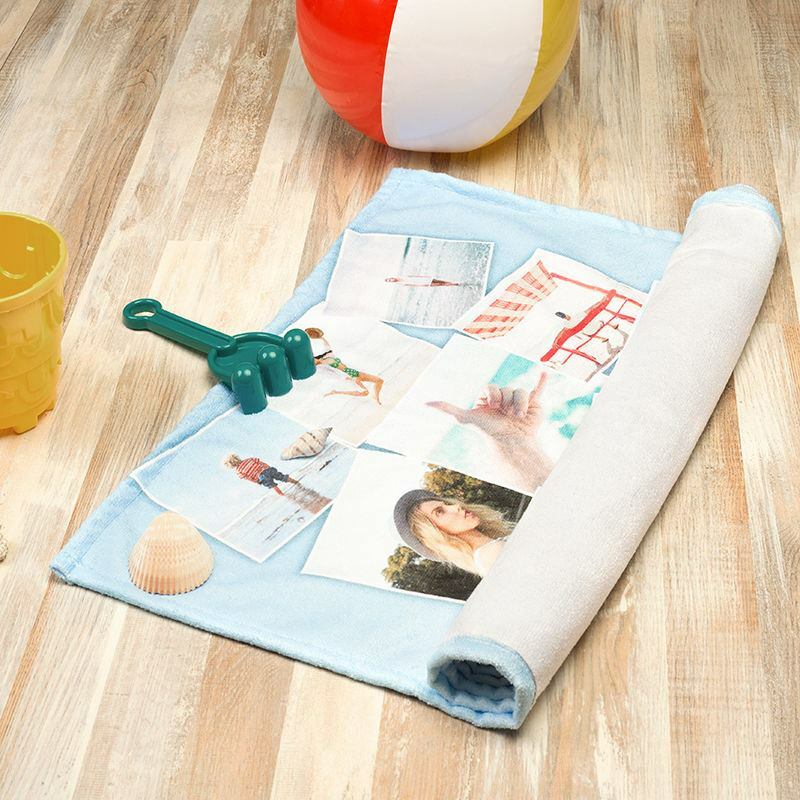 The simplest way to create your own beach towel is to print it with one photo. They look great especially on the double size towels, and so do photo collages. This popular and simple use of this product make it a great photo gift. We love to produce them and photo towels are fun to make, fun to give and fun to use on the beach, around the pool, or even just at home. No minimum means you can order any number of towels, from one single photo towel to a truckload. If you own a business and want to create your own promotional towels then you can do so by uploading your company name, motto, logos, and any design that represents your company message. Try out our preview design tools to see what yours could look like.